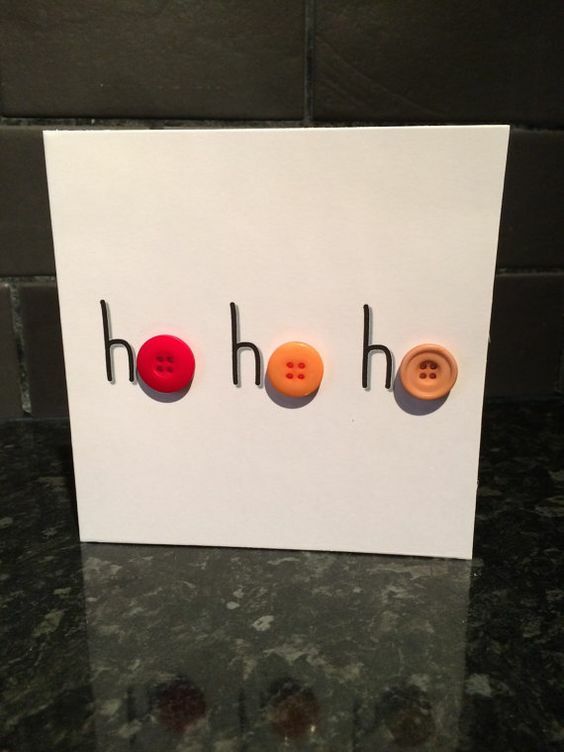 In our earlier post, we looked at the ways you can use buttons in the design of your homemade greetings cards. Here, we take a look at using them in Christmas card design and feature some ideas to help get you started or to give you inspiration for your own projects. We looked before at using buttons to represent balloons on your designs. This, obviously, translates really well into using them as Christmas baubles as these are not dissimilar to balloons in terms of shape. Image source & instructions: click here. This card design is completely pared back and easy to make your own. The letters can be handwritten (unless you are me!) and three buttons used as you can see below. You could always use different sized buttons of the same colour to give some perspective to the design or just use three different bright colours to “up” the jollity level. Sometimes it’s good to have a quick to execute design up your sleeve when you want to make several cards. The more intricate and time consuming the design, the more the card will be a “one off” for a special person. This design I’ve spotted is another one which looks quite pared back yet is very effective. 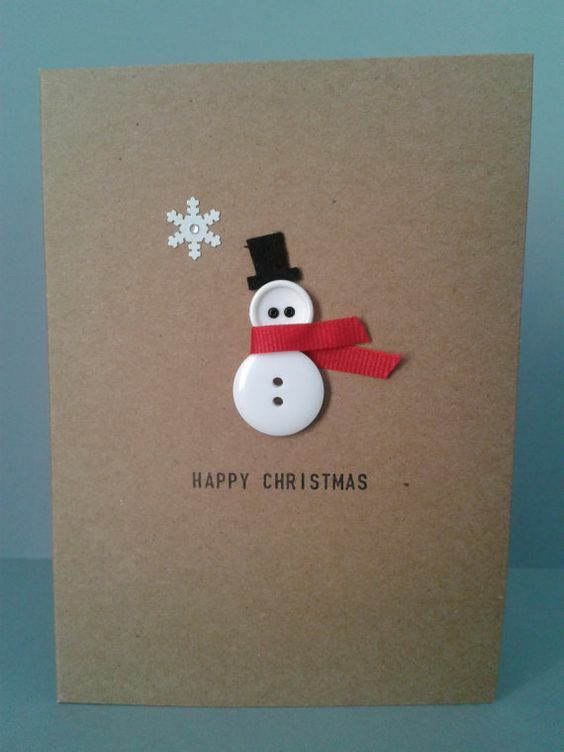 The use of a darker coloured cardstock really helps the snowman image stand out. It would be a great starting point from which to make this design your own. Here’s a quick and easy tutorial on how to make an effective but simple card using just one button. The video only takes a couple of minutes to watch but you’ll see that the end result is an on trend card which involved very little in the way of materials. Instead of using an old folder as Becca does (you may have one or two lying around the house), you can find some great cardstock here. 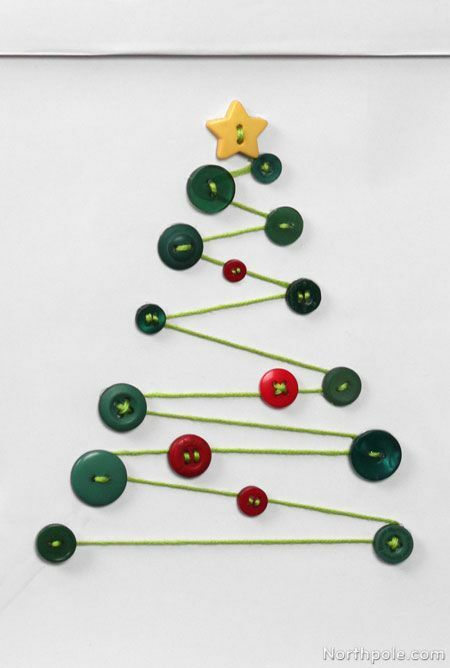 Christmas trees make a fab picture on a greetings card and buttons can be used to great effect to create a myriad of tree shapes and colours. And of course buttons come in very many sizes and shapes which adds to the variety you can put into your designs. I have seen this design (right) on Pinterest and although the instructions are actually for a gift bag, I think it would translate really well into a card design. Just a matter of scale. It looks elegant and uncluttered which I think adds to its attractiveness. The trick here, is to choose the right sized buttons so that you achieve the correct balance throughout the design. 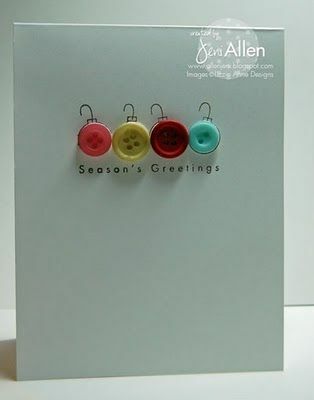 We like this Festive Lights cardstock from CraftStash as a way to make your homemade Christmas cards really stand out. With a bright background you can add a minimalist design and let the cardstock shine through or really bling it up – whatever takes your fancy!